Posted on Wednesday, March 12th, 2014 at 8:19 am. Boxing History: March 11, 1989 Evander Holyfield KO 10 Michael Dokes, Las Vegas. Great fight!!! Evander Holyfield (born October 19, 1962) is a retired American professional boxer. He is a former Undisputed World Champion in both the cruiserweight and heavyweight divisions, earning him the nickname “The Real Deal.” After winning the bronze medal in the Light Heavyweight division at the 1984 Summer Olympics, he debuted as a professional at the age of 21. Holyfield moved to the cruiserweight division in 1985 and won his first title the following year, when he defeated Dwight Muhammad Qawi for the WBA Cruiserweight belt. 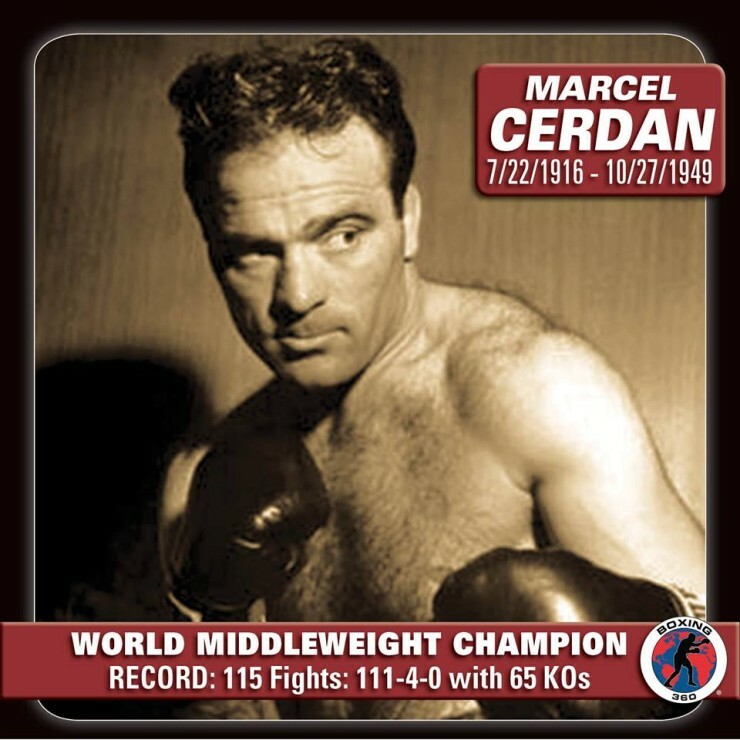 He then went on to defeat Ricky Parkey and Carlos De Leon to win the Lineal, IBF and WBC titles, becoming the Undisputed Cruiserweight Champion. Holyfield moved up to heavyweight in 1988, defeating Buster Douglas for the The Ring, Lineal, WBC, WBA and IBF titles in 1990. Evander Holyfield holds other notable victories over fighters such as; George Foreman, Larry Holmes, Riddick Bowe, Ray Mercer, Mike Tyson (x2), Michael Moorer, John Ruiz, Michael Dokes and Hasim Rahman. Holyfield is the only 4-time World Heavyweight Champion, winning the WBA, WBC, and IBF titles in 1990, the WBA and IBF titles in 1993 and the WBA title in 1996 and 2000. The Boxing Writers Association of America Fighter of the Year for 1990, 1996, & 1997. The WBA presented Holyfield with the Muhammad Ali Award for becoming a three-time heavyweight champion in 1996. 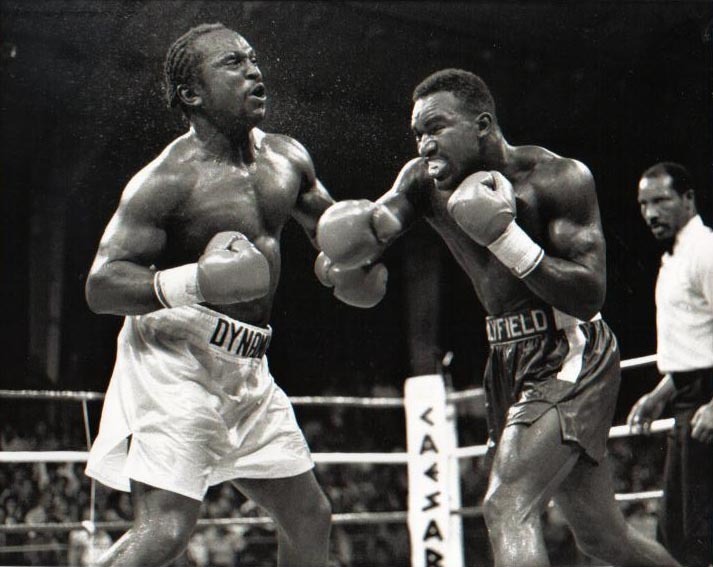 Evander Holyfield vs. Dwight Muhammad Qawi I was named the best cruiserweight fight of the 1980s by The Ring Magazine. Evander Holyfield vs. Michael Dokes was named the best heavyweight fight of the 1980s by The Ring Magazine. Evander Holyfield vs. Riddick Bowe I was The Ring Magazine Fight of the Year for 1992, and the 10th round was the Round of the Year. Evander Holyfield vs. Mike Tyson I was The Ring Magazine Fight of the Year and Upset of the Year for 1996. Evander Holyfield vs. Mike Tyson II was The Ring Magazine Event of the Year for 1997. 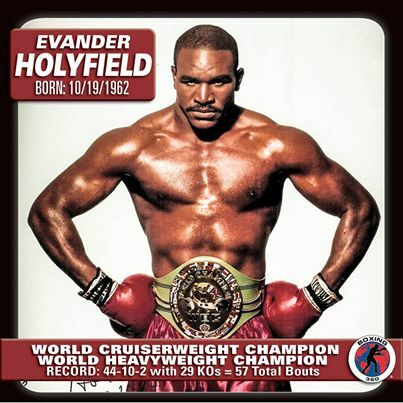 The Ring Magazine ranked Holyfield as the greatest cruiserweight of all-time in 1994. The Ring Magazine ranked Holyfield as the 3rd greatest heavyweight of all-time in 1998.